I recently began revisiting my Yoga practice as a means for stress relief and recovery post surgery. Unfortunately, I've been exposed to a lot of negative energy and decided it was time to stop letting that affect me and start working on ways to release the building tension. A more practical approach would be to eliminate the sources of negativity from my life, however at this time this action would only be a temporary solution. So onward to my rekindled practice. I began practicing Yoga in high school over 14 years ago. I used to come home and every day at 4 o'clock, Fit TV would have a program they offered every week day. This is where I began to discover the benefits of Yoga on my mind, body, and spirit. I would feel rejuvenated from these practices. As life began to get in the way and program scheduling changed, my Yoga practice changed throughout the years and every once in awhile, I'd find myself revisiting my practice. In 2010 while teaching at a pole dancing studio, I decided to study the various forms of poses to incorporate into a class that would be designed specifically towards increasing flexibility for pole dancers. Instead of incorporating just body poses, I utilized the apparatuses that were made available to me through convenience and my willingness to put forth the extra effort to design substantial tools to benefit my overall goals. Thus was born, Sensuous Flow & Flexibility. The class incorporates the breath and Hatha Yoga technique. 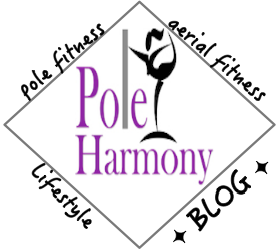 Areas of target are specific to pole dancing moves that require flexibility. Anyone can create a class for this purpose and many studios do. I didn't create anything new that people weren't already doing. The only difference between my class and the many others out there is mine is individual to what I found to work best for me through my own experience. As I'm sure is the case for the many other classes out there. Recently I decided to rejoin the ranks of reacquainting myself in the student role. I've begun to take classes at various studios, enjoying the variety of Yoga practice. I've also begun to use this as an opportunity to enhance the healing process of my body post surgically. I'm limited in movement now in my core, when I used to have a substantial amount of flexibility in both my core and back. Two areas in pole that flexibility is beneficial. I have always been an advocate for listening to your body and knowing your limitations. I have listened to my body and it craves the gentleness of Yoga as a means to progressively heal and strengthen to it's former capabilities. In addition to taking the occasional studio class, I've also found an alternative means of practice for at home. DVDs can get boring after awhile. They're great to have to give yourself variety to work on specific poses but when you really want to explore other routines, I've found online Yoga classes to be the perfect substitution to the real class room experience. I've recently discovered Free Online Yoga Videos through DoYogaWithMe.com. The site has multiple videos explaining poses, meditations, breathing techniques, anatomy, an online community forum, and class routines for beginner-advanced curriculum. You can also search for a specific class based on difficulty, class duration, style, and instructor. I have found the addition of online Yoga videos to be great for when I can not find a studio class to satisfy the time I have available for my practice and when I want to let go of my own typical structure of practice and experience something different. There are other sites out there that offer Yoga classes online, however I mentioned DoYogaWithMe.com because it is free and does not require a monthly membership fee to access. Over time, I may subscribe to a membership online. Right now I've found what works for me and will continue to use the free resources made available until my practice needs enrichment through other sources. Namaste. thanks for the yoga site link! I have been wanting to try out yoga more seriously but the local studio is crazy pricey and dvds get boring for me. I had no idea doyogawithme existed!